It's def her moment. Cardi B. flexed all over tonight's GRAMMYS red carpet, extra ready for that spotlight. Her dress, her man, and a whole squad made for an epic pull up. Dripping in 28 carats of Nuvola Bianca White Cloud Collection 28 Carat Double-Drop Diamond Earrings by Gismondi175, Cardi B. was the vintage belle of the GRAMMYS ball. 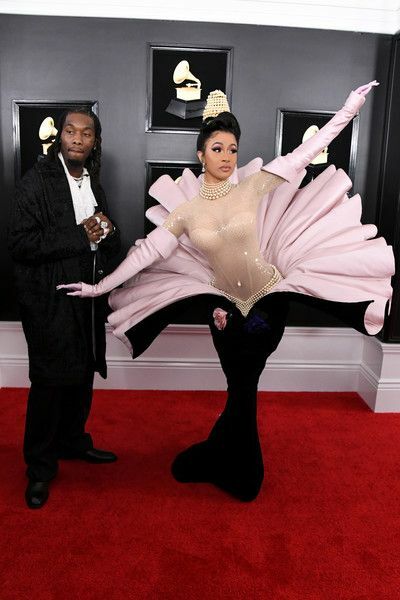 The "Money" rapper pulled up in a look from the fashion history books - a vintage Thierry Mugler structured, fanned out, black and pink mermaid style gown from the 1995 collection. Cardi and her rapper husband Offset let us ALL know they're all the way back on, and Cardi had all the money poses for the masses. Def not what we expected, even though we probably should have. Offset might as well had been her prop after their tongue kiss (she said she couldn't use her lips and mess up her makeup so naturally, this was the next best thing). She killed her performance of "Money" too. Clap for ha!